Week 11 had some thrillers with memorable performances that will go down in the annals of NFL history and several NFL Regional Combine standouts were a part of a week that was filled with action. Since starting the season 2-0, the Denver Broncos were 1-6 entering Week 11. Fresh off the bye, the Broncos need a win, and the red hot Los Angeles Chargers was the squad to get their season back on track. The Broncos played well enough to keep the Bolts from flashing up and down the field. With the game on the line with :03 left in regulation, after driving down the field, the Broncos called upon their veteran, Super Bowl winning kicker Brandon McManus to pull them through like old times. From the Chargers’ 16-yard line, McManus lined up and kicked perfectly for his only field goal attempt of game. This was McManus’ first game-winning field goal of the season. Against the Houston Texans in Week Nine, McManus had an opportunity for the go ahead winning field goal but he missed. This game was a must win for the team, but the situation was much need for McManus. Clearly, if the Broncos can keep games close, the Broncos know they have a weapon in McManus to help get them through some tough battles. In the same match up, Chargers linebacker Jatavis Brown led the team with eight tackles. All appears to be good in Indianapolis with healthy quarterback Andrew Luck and his supporting cast. The defense also is rolling as well with solid pressure up front from linebacker Darius Leonard and an aggressive back end led by cornerback Kenny Moore II. Moore was all over the field against the Tennessee Titans as he continuously looks to destroy anyone coming across the middle. He led the Colts in tackles with 10, including earning his first NFL sack. With 10:05 in the first quarter, the Titans faced a third-and-8 from the Colts’ 34-yard line. 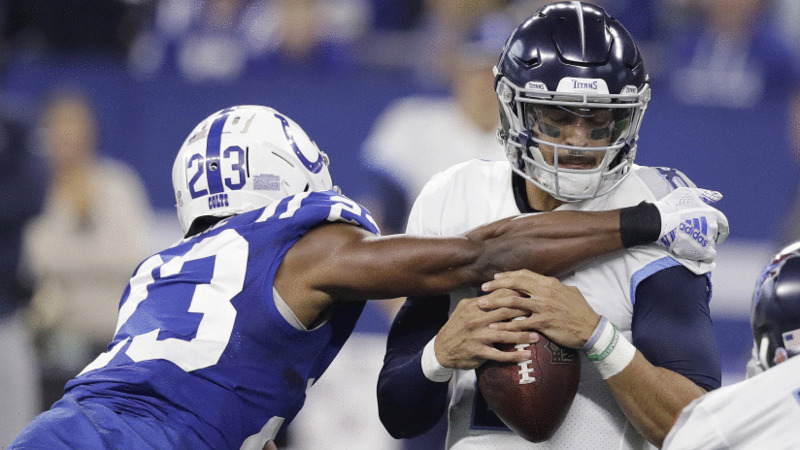 Titans quarterback Marcus Mariota was in shotgun formation and after the snap, Moore came flying in on a blitz and met defensive tackle Jabaal Sheard at Mariota for a sack, losing eight yards. After being in the NFL for two seasons, Green Bay Packers tight end Robert Tonyan earned his first reception, which also was his first career touchdown. Against the Seattle Seahawks, the Packers faced second-and-10 from their 46-yard line with 3:21 left in the first quarter. Quarterback Aaron Rodgers scrambled to extend the play and threw deep down the middle of the field to Tonyan, while covered, for 53 yards. Tonyan caught the pass and ran for one-yard into the endzone. Not only was Tonyan’s score was the first of his career, he became the first player from Indiana State to score a touchdown in the NFL. The NFL Regional Combine pioneer from the 2017 trials is the 11th player in the school’s history to make it into the NFL. Not bad for a young tight end who is slightly nervous around the legendary quarterback. Cincinnati Bengals tight end Matt Lengel is far beyond nervousness. His first touchdown catch was on a pass from New England Patriots quarterback Tom Brady, arguably the best quarterback of all-time, and winning a Super Bowl ring. Lengel just wanted the opportunity to prove he can be one of the featured tight ends in the NFL and his touchdown against the Baltimore Ravens is just the beginning of the process. In the third quarter with 11:50 left at the Ravens’ 4-yard line on first-and-goal, Bengals quarterback Andy Dalton was under center. Lengel was lined up on the inside, and after the snap, he broke inside clean with no Raven covering him in their zone. Dalton drilled a quick pass to the sure-handed Lengel for his first touchdown of the season. Lengel is used heavily for line support. In the near future, expect Lengel to be utilized more in the passing game, especially as he continues to come through on the little things. -New York Giants running back Elijhaa Penny had two catches for four yards. -Minnesota Vikings Adam Thielen hauled in seven catches for 66 yards. -Oakland Raiders wide receiver Seth Roberts had four catches for 38 yards.